DePaul came into the game on Sunday in a precarious situation, a must-win game game against Villanova and senior day on their minds. With only two games left in the regular season, four teams found themselves separated by only a point for the last spot in the Big East tournament starting next week. The Blue Demons knew coming into this game, they faced a must-win game if they hope to have any chance of playing in the tournament. After a hard-fought 90 minutes, the Blue Demons prevailed 1-0 against the Villanova Wildcats to keep their playoff hopes alive. After seniors Franny Cerny, Madeline Frick, Vanessa Nigg, Elizabeth Parrilli, as well as, redshirt junior Avery Hay were honored in a pre-game ceremony, the Blue Demons turned their focus on beating the Wildcats. In the first half, DePaul played like a team who knew their backs were against the wall and needed all three points. The Blue Demons controlled the entire first half generating 12 shots, but for 44 minutes weren’t able to break through on the score sheet, until a moment of brilliance from sophomore forward Jade Eriksen-Russo. With 41 seconds left in the half senior, goalie Mollie Eriksen played a long ball forward to Russo who cut inside inside the box onto her left foot and curled a shot into the top corner, out of the reach of the Wildcats goalie. Russo recently returned to the team after being injured and after the game she said she was happy to be back on the field, and even happier to score the game winner. DePaul took a 1-0 lead into halftime knowing that the next 45 minutes were going to be crucial for their playoff hopes. The Wildcats who looked a step behind for the entire first half, responded in the second half by creating more chances, but never forced Eriksson to make any important saves. The second half turned into a much more physical affair, the Blue Demons got two yellow cards within the first 15 minutes of the second half. DePaul did a good job of suffocating the Wildcats attack by getting numbers behind the ball and recovering the ball in good areas. The team knew how important this game and senior forward Franny Cerny described after the game that she and the rest of the team didn’t want the season to end today. Even though they were excited to have their families with them and celebrate their success, Cerny and her teammates put it all out on the field. The Blue Demons will turn their attention to the regular season finale on Thursday against St. John’s. DePaul will come into that game sitting on 11 points and have a chance with a win to sneak into the six-team playoff. 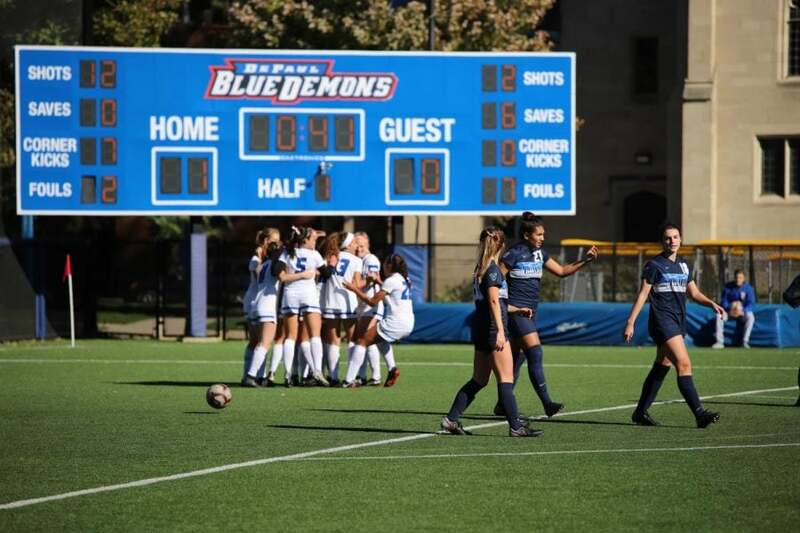 Last season the Blue Demons entered the final game of the regular season in the exact same spot, needing a result against St. John’s and came away with a 1-0 win on a game-winning goal from Cerny in the 43rd minute.